Jason, owner of CDJ Rentals, contacted BsnTech several months ago to request a website design. His primary purpose was to put an application online that potential tenants could fill out to rent any of the properties that CDJ Rentals manages. After a couple of months, Jason was ready to get started with the site and sent us the information to start on the site. We started right away and had the information up and active within just a few days. Since then, Jason has asked us to create a logo for his company although this order is still pending. 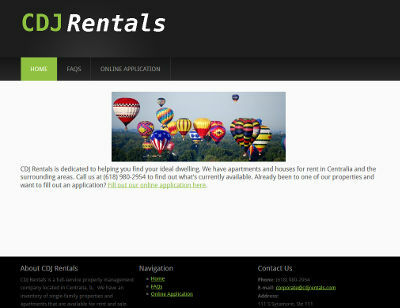 The CDJ Rentals website is at cdjrentals.com.